The team of 'Doka Chalval Ka' , a popular Quiz Series on DD Sahyadri organised an episode with the Students of VIVA School of Architecture. All interested can catch this special episode will be aired on 10th Jan. 2019 at 5:30 pm. The show will be re-telecasted on 11th Jan. 2019 at 9:00 pm. "The campus of VSOA lies amidst a lush green background in Shirgaon, with more than 200 acres earmarked as an educational and institutional zone. Within five years of its inception, today, VSOA can boast to be one of the largest buildings dedicated for architectural education in Maharashtra." The Notice for dates of National Aptitude Test for Architecture (NATA) 2019 by Council of Architecture. Please visit www.nata.in for further information. Student of VIVA School of architecture wins at prestigious competition : "The Park Elle Decor Student Contest 2019"
Sreejith Kini, Final year Student of VSoA, makes the school proud by bagging the first position at "The Park Elle Decor Student Contest 2019" in the architecture Category. His Design project - 'Dance Academy at Vasai' will be showcased at INDIA DESIGN ID 2019 at Delhi between 12th - 15th February . The fraternity at VSoA wishes him all the best for his showcasing and other future endeavours. Time table for Semester Examinations, October 2018 for all Semesters can be accessed in the link. Please make sure to clear all the dues before the due date. Time table for Supplementary Exam, October 2018 can be accessed here. Please click the link for further details. make sure to clear your examination dues before the due date. First Year Architecture admission intake increased from 40 to 80 for academic year 2018-2019. Time table of Viva Voce for University of Mumbai, First half 2018 declared for New Syllabus for Sem VI, sem X and for old syllabus Final year and Fourth year . College Jury dates for Sem II ,III, IV, V, VII, IX declared. 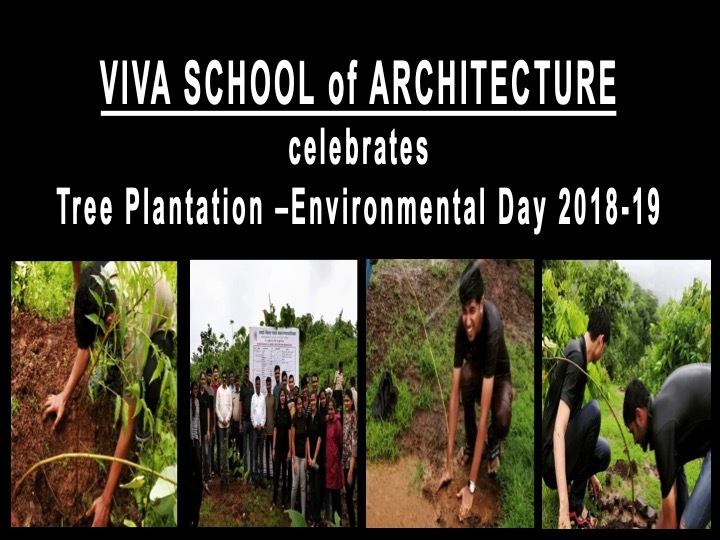 VIVA SCHOOL of ARCHITECTURE, SHIRGAON. OLD VIVA College, Virar West.